University of Rochester President Joel Seligman, with 2013 Diversity Award winners Suzanne Piotrowski (THSP), Kevin Graham (THSP), Alyssa Cannarozzo (THSP), Lynne Maquat of the Medical Center, Kim Muratore (THSP), and Vice Provost for Faculty Development & Diversity Vivian Lewis, at the Diversity Awards reception at Witmer House on January 10, 2013. The Teen Health and Success Partnership (THSP) and Lynne Maquat, the J. Lowell Orbison Chair and Professor of Biochemistry and Biophysics and at the University of Rochester Medical Center, were honored as the 2013 Presidential Diversity Award recipients. They were publicly recognized during the University's annual Martin Luther King Jr. Commemorative Address, held the evening of Thursday, Jan. 17. Both awardees were chosen for their commitment to helping underrepresented minority students achieve their academic goals. Led by Suzanne Piotrowski, THSP develops employment opportunities at the University for urban teens who are at risk of dropping out of high school. Maquat was honored for her work with the University of Rochester Graduate Women in Science (GWIS) initiative, which provides outreach and mentoring for women scientists and scientists-in-training. "Diversity is a core value of the University," said University President Joel Seligman. "I am delighted to recognize two outstanding teams who have been remarkably successful in supporting students at critical points along the educational pipeline." Launched in 2009, the Teen Health and Success Partnership works with University departments, the Rochester City School District, the Hillside Work Scholarship Connection, and a host of community agencies to create University employment opportunities for at-risk, underrepresented minority teens. In just three years, the program has grown from 11 to 100 participants employed in 36 different departments across campuses. The program boasts a 100 percent high school graduation rate and 87 percent of those teens have enrolled in college or trade school. The program has become a national model for health facilities and has been replicated in Syracuse, N.Y. and Prince George's County, Md. More than just an employment opportunity, the program provides youth access to health care services, libraries, computer labs, counseling services, college application preparation support, academic tutoring, leadership and management skills workshops, and campus social, cultural and athletic events, among others. "The word in Rochester's high school hallways is that the UR is a great place for teens to work and pursue their career goals," wrote Kathleen Parrinello, URMC vice president and SMH chief operating officer, in a letter nominating THSP for the award. Lisa O. Beckford, a nurse recruiter at Golisano's Children Hospital, noted that the Strong Memorial Hospital Nursing Department, which employs 12 students through THSP, has benefitted tremendously from the "professional, skillful work and youthful optimism, enthusiasm, and energy" of the THSP students. "UR staff grows both personally and professionally by mentoring and interacting with the THSP student employees," she wrote. "THSP students are an integral part of our team and with the support of the program, we are able to retain and support these team members and their worksite supervisors in the most efficient and best way possible." Nancy M. Bennett, director of the Center for Community Health, wrote that the team at THSP has been critical to the program's success. "Through their observable, consistent behavior, the Teen Health and Success Partnership team demonstrates that their work with urban Rochester youth is not just a job, it is a commitment, and a covenant," she explained. An internationally respected researcher and scholar, Lynne Maquat has spent her career advocating for young women in the sciences. Perhaps the best demonstration of her dedication to young post-doctoral and graduate students is the University's Graduate Women in Science (GWIS) program, which she founded in 2003. Funded through an NIH grant, the program has grown into a highly valued means of outreach and mentoring for women scientists. Each month, GWIS hosts a round-table discussion of high-profile speakers who are using advanced degrees in traditional and non-traditional ways. Speakers share how they successfully navigated their own personal and professional hurdles. Elizabeth J. Grayhack, associate professor, biochemistry and biophysics and director of the undergraduate biochemistry program, wrote that "this type of personal interaction is amazingly helpful to young scientists in navigating a career in science." In 2011 Maquat, who serves as director of the University's Center for RNA Biology, was elected a member of the National Academy of Sciences�one of the highest honors for a scientist�for her exceptional work in the field of RNA biology. She has been a member of the RNA Society since its formation in 1993 and was honored with the society's Lifetime Achievement Award in Service in 2010. She also was elected to the American Academy of Arts and Sciences and the American Association for the Advancement of Science in 2006. "At every point in her career, Dr. Maquat has used her position and notoriety as a highly successful scientist as leverage in her pursuit of gender equality in STEM careers," wrote Jeffrey J. Hayes, professor and chair of biochemistry and biophysics, in a nomination letter. "Her long history and commitment to furthering the careers of women and minority scientists is truly impressive and inspirational and indicates at true dedication to the cause." The Presidential Diversity Awards were created in 2009 by Joel Seligman to recognize faculty, staff, students, units, departments or teams that "demonstrate a commitment to diversity and inclusion through recruitment and retention efforts, teaching, research, multi-cultural programming, cultural competency, community outreach activities, or other initiatives." This year's winners were chosen from among eight nominees who were recommended by their colleagues. 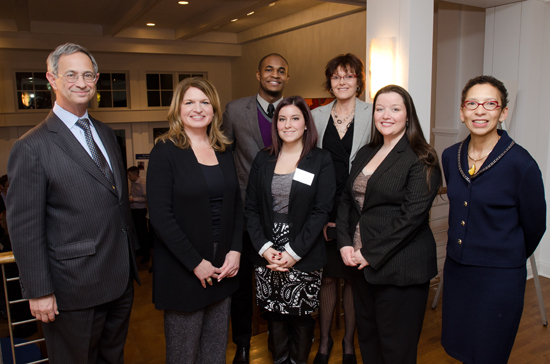 The recipients and other nominees also were honored at a reception with the president and other University leaders at the Witmer House. Each Presidential Diversity Award includes a $2,500 prize; individual award winners receive half and designate half to support the budget of a program or department of the winner's choice. Team award winners designate the entire $2,500 prize to the program or department of the team's choice. "By recognizing the incredible accomplishments of our faculty, staff, students, and teams, we move closer to reaching our vision of a University that reflects and celebrates the richness of diversity among individuals and groups," said Dr. Vivian Lewis, deputy to the president and vice provost for Faculty Development and Diversity and chair of the award's selection committee. "This year's nominees show us yet again what important work on diversity and inclusion is happening at our University, and I congratulate them all on their hard work and commitment."